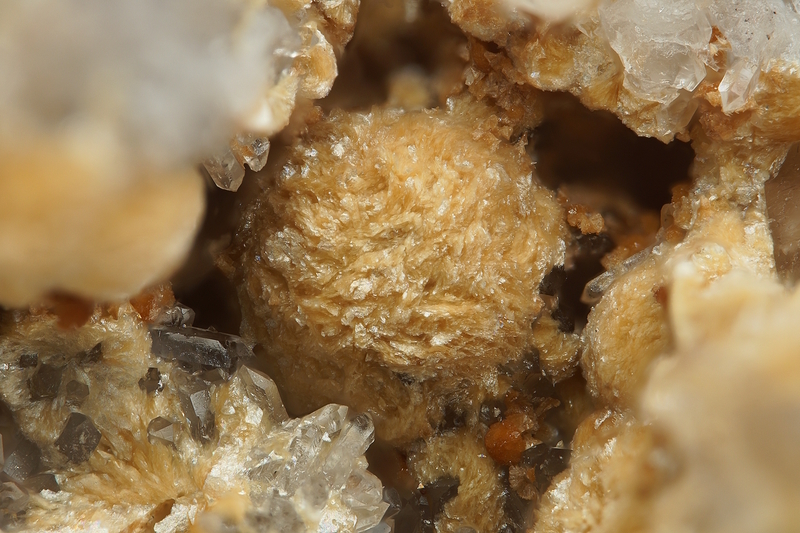 Ganophyllite: Mineral information, data and localities. Named in 1890 by Axel Hamberg from the Greek γανωμα for "brilliance or luster" and φύλλον for "leaf," in allusion to the high luster on platy cleavage surfaces. Ganophyllite Group. The potassium analogue of Eggletonite. Compare UM1990-61-SiO:AlCaHKMnNa. 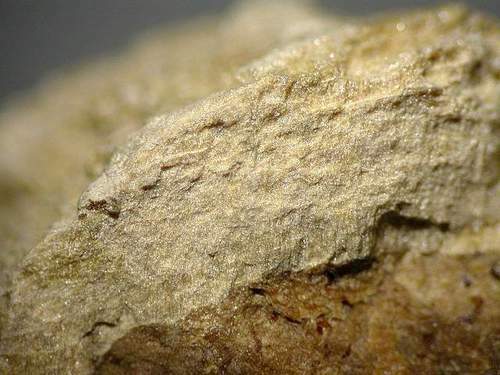 May be visually similar to bannisterite and parsettensite. Eggletonite (Na,K,Ca)2(Mn,Fe)8(Si,Al)12O29(OH)7 · 11H2O Mon. Tamaite (Ca,K,Ba,Na)3-4Mn24(Si,Al)40(O,OH)112 · 21H2O Mon. Clinohedrite 22 photos of Ganophyllite associated with Clinohedrite on mindat.org. Hendricksite 22 photos of Ganophyllite associated with Hendricksite on mindat.org. Roeblingite 18 photos of Ganophyllite associated with Roeblingite on mindat.org. Xonotlite 15 photos of Ganophyllite associated with Xonotlite on mindat.org. Rhodonite 11 photos of Ganophyllite associated with Rhodonite on mindat.org. Axinite-(Mn) 7 photos of Ganophyllite associated with Axinite-(Mn) on mindat.org. Prehnite 7 photos of Ganophyllite associated with Prehnite on mindat.org. Cahnite 6 photos of Ganophyllite associated with Cahnite on mindat.org. Bementite 6 photos of Ganophyllite associated with Bementite on mindat.org. Willemite 5 photos of Ganophyllite associated with Willemite on mindat.org. 74.1.2.2 Eggletonite (Na,K,Ca)2(Mn,Fe)8(Si,Al)12O29(OH)7 · 11H2O Mon. Smith, M.L. and Frondel, C. (1968) The related layered minerals ganophyllite, bannisterite and stilpnomelane. Mineralogical Magazine: 36: 893-913. Jefferson, D. A. (1978): The crystal structure of ganophyllite, a complex manganese aluminosilicate. I. Polytypism and structural variation. Acta Crystallogr., A34, 491-497. Dunn, P. J., Peacor, D. R., Nelen, J. E. and Ramik, R. A. (1983): Ganophyllite from Franklin, New Jersey; Pajsberg, Sweden; and Wales: new chemical data. Mineralogical Magazine 47, 563-566. Eggleton, R. A. and Guggenheim, S. (1986): A re-examination of the structure of ganophyllite. Mineralogical Magazine 50, 307-315. Guggenheim, S. & Eggleton, R.A. (1986): Cation exchange in ganophyllite. Mineralogical Magazine 50, 517-520. Noe, D. C. and Veblen, D. R. (1999): Incommensurate modulation and the crystal structure of ganophyllite. American Mineralogist 84, 1088-1098. The following Ganophyllite specimens are currently listed for sale on minfind.com. Castellaro, F., Passarino, G. (2011): I minerali di Monte Alpe. Sezione dell'antica Concessione Tre Monti (La Spezia e Genova). Rivista Mineralogica Italiana. 4/2011, 214-224. Cámara, F., Ciriotti, M.E., Bittarello, E., Nestola, F., Massimi, F., Radica, F., Costa, E., Benna, P., Piccoli, G.C. (2014) Arsenic-bearing new mineral species from Valletta mine, Maira Valley, Piedmont, Italy: I. Grandaite, Sr2Al(AsO4)2(OH), description and crystal structure. Mineralogical Magazine, 78, 757-774; Cámara, F., Bittarello, E., Ciriotti, M.E., Nestola, F., Radica, F., Massimi, F., Balestra, C., Bracco, R. (2017a) As-bearing new mineral species from Valletta mine, Maira Valley, Piedmont, Italy: III. Canosioite, Ba2Fe3+(AsO4)2(OH), description and crystal structure. 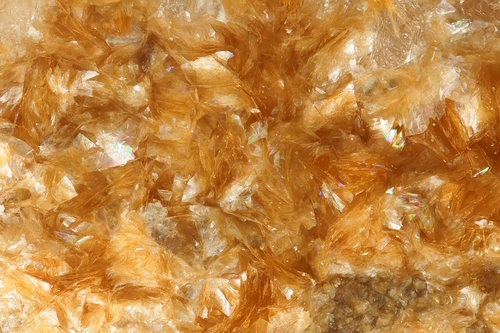 Mineralogical Magazine, 81, 305–317. M. Nakagawa, M. Santosh, S. Maruyama (2009) Distribution and mineral assemblages of bedded manganese deposits in Shikoku, Southwest Japan: Implications for accretion tectonics. Gondwana Research 16, 609–621. [MinRec 32:419]; Matsubara S, Miyawaki R, Yokoyama K, Shimizu M, Imai H (2004) Tokyoite, Ba2Mn3+(VO4)2(OH), a new mineral from the Shiromaru mine, Okutama, Tokyo, Japan. Journal of Mineralogical and Petrological Sciences 99, 363-367; photo in: Koubutsu Doshikai (2017) Kanto-to Shuhen-no Koubutsu (279pp). Moore, P. B. (1972). III. On Igelström's Manganese Arsenates and Antimonates from the Sjö Mine, Grythyttan, Örebro County, Sweden. GFF, 94(3), 423-434. Magnusson, N.H. (1929): Nordmarks malmtrakt. Sveriges Geologiska Undersökning, series Ca 13, 98p. Hamberg, A. (1890): Mineralogische studien. 9. Ueber Ganophyllit, ein manganzeolith von Harstigen. Geologiska Föreningens i Stockholm Förhandlingar. 12, 586-598; Smith, M.L. and Frondel, C. (1968) The related layered minerals ganophyllite, bannisterite and stilpnomelane. Mineralogical Magazine: 36: 893-913. Ounchanum, P. & Morad, S. (1987): Paragenesis of akatoreite and ganophyllite in the manganiferous rocks of the Häste Field, Norberg ore district, central Sweden. Neues Jahrbuch für Mineralogie, Abhandlungen 157, 225-244. Rogers, Austin Flint (1919b), An interesting occurrence of manganese minerals near San Jose, California: American Journal of Science, 4th. Series: 48: 446; Murdoch, Joseph & Robert W. Webb (1966), Minerals of California, Centennial Volume (1866-1966): California Division Mines & Geology Bulletin 189: 192; Pemberton, H. Earl (1983), Minerals of California; Van Nostrand Reinholt Press: 410.; USGS (2005), Mineral Resources Data System (MRDS): U.S. Geological Survey, Reston, Virginia, loc. file ID #10077482. Smith, M.L. & Frondel, C: Mineralogical Magazine:36:893-913 (1968); Hurlbut, C.S., Jr. & Baum, J.L. : Am. Min. :45:1137-1143 (1960); Palache(1935):114; Dunn(1995):Pt4:494.